Stability, breathability, and quick access pockets on the Endurance Pack make it perfect for any endurance event. It features a highly breathable and durable mesh that transfers heat quickly away from your body, yet is still soft on your skin. We balance the use of stretchy materials where needed, but use firm materials where we need to maintain stability of fluids and gear. This pack is excellent for carrying your fluids, plus sized phone, electrolytes, and essentials while running and riding! The key to fit, cinch the sides first, not the front, until you feel the pack anchor on your shoulders. Then adjust the front harness as needed so you can breathe during movement. Endurance Pack 4L, Version 2.0 Animation from Orange Mud on Vimeo. Fit: This pack is designed to be friendly with your curves. Just slide the sliders up and down to find the optimal fit and adjust the sides snug. Max chest size is around a 52” chest. If you need bigger let us know and we will add more to them! The HydraQuiver Single Barrel: Ideal running distances up to a marathon. Excellent pack for medium to long runs. I've tried and rejected quite a few hydration/gear packs for my trail and road running and really like the Orange Mud Endurance Pack. The balance of size and capacity work well for me and I can carry the absurd amount of fluid that the ridiculous amount of sweat I produce requires. 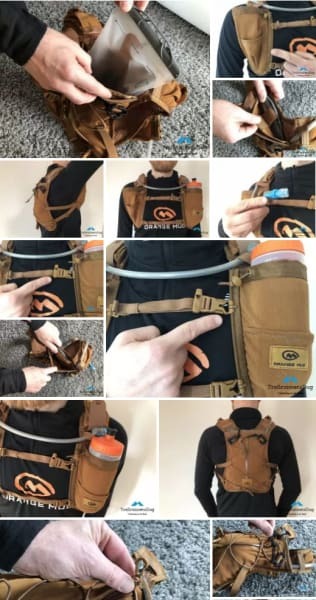 I tend to use the front pockets for my phone and other items I want to grab quickly and carry my fluids in the reservoir and encounter minimal bounce and slosh. Highly recommended. Glad you dig it James! Like the product, and have been using it regularly, but not sure if I've been using it correctly. No documentation. Does the bladder just get held in place by the piece of velcro inserted through the slider bar (bar used to close the bladder)? And how is that slider bar supposed to stay attached to the bladder? 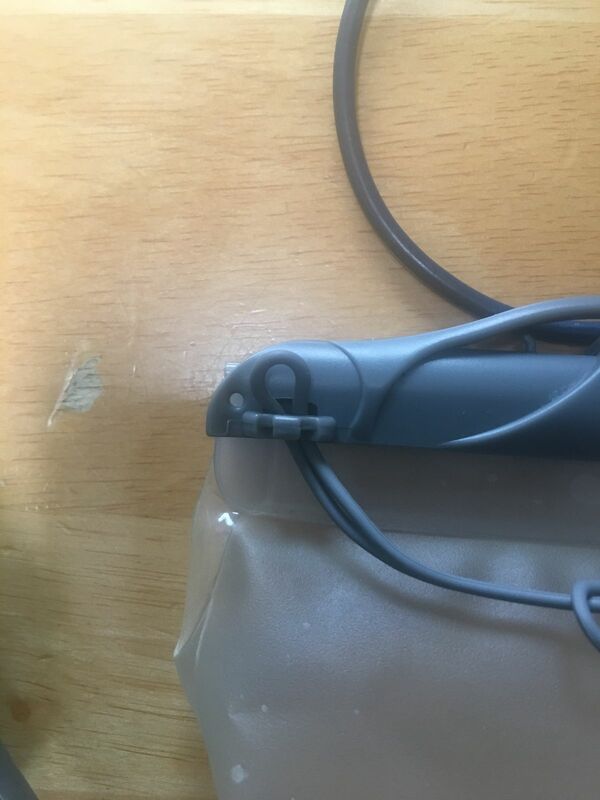 That little piece of plastic cord (for lack of a better term) that holds the slider to the membrane came loose, and I'm not sure how to anchor it properly. Also do not like the little shoulder pouches. Too hard to get anything out of there. Oh - and I wish your orange and black pack was all orange. If there's a choice, I buy by visibility, but would rather have had a choice of ALL orange vs. the lime green. I specifically went with this pack for more capacity than the gear vest and less cumbersome than the adventure pack. They all have their own places; personally, I prefer the adventure pack for casual bikepacking days and the vest for long runs. The Endurance Pack, however, fit the criteria for gravel racing. It is light. It fits just right without feeling too small or too large. It doesn't sway when I'm mashing the pedals or spinning up hills. The design keeps my cycling jersey pockets available to me unlike most reservoir bags. The 2L capacity offers me just enough water, along with two bottles in my frame, for about 60 miles of hard racing. This is perfect for most gravel events with checkpoints every 50 miles on average. Broke this bad boy in at the Curto Dirto 50 miler in Stillwater Oklahoma. Performed flawless and will be my go to water source at the Dirty Kanza 200. Just an all around great pack. Can hold tons of gear, water, and food!! Comfortable and no bounce!! Used it during a few training runs, but today I put it to the test on a 1/2 marathon trail run in the montains of North GA. Despite the rain and cold weather the pack held up great. This small pack has plenty of room to store layers as they came off, with room left over for the essentials. I had one issue, but still meets five stars rating. The top chest strap felt like if had a little to much elasticity in it, but that's just my me. This is my now go to pack. Thanks Corbin! Glad you dig it!